Camping in Africa is an adventure for sure. After spending over 4 years living on the continent, I know first hand it can be overwhelming for first-time visitors. But, the rewards are definitely worth it—seeing African animals in their natural habitat, hearing local women singing and experiencing the unique cultures are all unforgettable experiences. If you have camped in other parts of the world, you may be curious about how African camping compares to camping in America or Europe. This greatly depends on the countries you’re visiting, how long you plan to stay, and how adventurous you are. The truth is, there are very few areas that you can’t camp in Africa. And, generally, it is much more affordable than other parts of the world. This is especially true if you are willing to forgo some of the creature comforts and stay at locally owned campgrounds. If you are traveling through big cities, you will likely find a campsite within the city limits. These campsites are often small, and may not be able to accommodate overland vehicles. Many times, hostels will offer camping in their parking lots or garden areas. Typically, campsites within cities are owned by foreigners—which make them more expensive, but you may also get amenities you are not likely to find in rural areas. You will likely find that most have hot water available (although it may be during limited hours) and electricity. They may also have on-site restaurants, which can be a nice way to take a break from cooking. Security: You will see right away how secure your campsite will be based on how secure the property is. If it is a hostel, chances are they will have sufficient security. In remote areas there are a few options. Many locals are capitalizing on the thousands of people that camp their way through Africa each year, and have created campsites. These locally owned and run campsites are typically basic—but are a great way to find tour guides and people that can give you insider tips on things to see in the area. If there is a local hotel, you can also ask if you can pitch your tent outside. We did this several times, once they didn’t even charge us—they just asked us to buy dinner at the local restaurant. If no campsites are available, feel free to ask a local chief if you can camp in the village. They will likely welcome you and provide true African hospitality. Security: If you are concerned about security, you can always pay someone to watch your tent. If you are paying to camp, likely it will include security. If you do have someone watch your vehicle/site, and there are no incidents, be sure to give a tip. 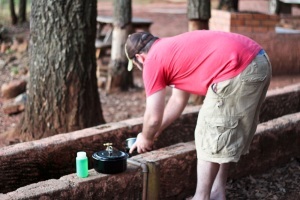 Camping in National Parks throughout Africa can be surprisingly expensive. There are typically fees for entry and camping. Typically the entry fees apply to each day you spend in the park—in the Serengeti that can mean $50 per day per person, plus camping fees. Less popular parks will typically have lower fees. Security: Security is likely to be very good within the National Park—keeping both animals and people away. If you are traveling through Southern and Eastern Africa, chances are you will be able to find campsites. But, if you are traveling in other areas, or if you do not make it to a campsite, you can “bush camp”. By pulling off the road, and pitching your tent you can camp in remote areas. If there is a village nearby, it’s always a good idea to ask permission. Security: It’s good to be aware of your surroundings while bush camping. Chances are you will be left alone, but there is always the chance of wild animal sightings!